"Decent Advice To Help You Navigate The Initial Stages Of A Breakup"
Focuses on controlling your emotional state and ensuring you don't act in a desperate and needy way. By following the advice you'll have a better perspective on whether you should try and get back together with your ex, as well as increase our chances of getting them back. Mainly offers a one-size-fits-all approach, meaning the method doesn't take into account why you broke up. Writing is a bit sloppy and the presentation isn't all that professional. Nothing really original here. Most of the advice centers around giving your ex plenty of space and getting on with your life in the meantime. So if you're the type of person that has been guilty of smothering your ex, or you'd be likely to do so, this'll be especially helpful for you. Be aware that there are no magic cures, and depending on why you broke up, there's no guarantee that you'll get back together. 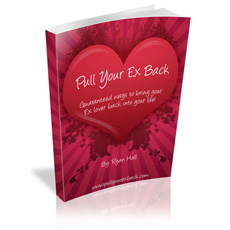 Pull Your Ex Back is written by Ryan Hall and is aimed at both men and women. It gives you a blueprint of what to do in the initial stages of a breakup so that you give yourself the best chance of being able to reconcile with your ex, or perhaps moving on from the relationship. There's not really any advice on what to do if you've been separated for some time, so the earlier you can apply these ideas the more effective it's likely to be. The main focus to begin with is making sure you don't do anything to make the situation worse. People often react to their partner breaking up with them by chasing after them, displaying needy behaviors that will usually push the person further away. As Ryan talks about in this book, they're making decisions in a highly emotional state, which is almost always a mistake. So this book is mostly useful for you if you're really struggling emotionally with the breakup, worried that you can't live without the other person and desperate to do anything to get them back. The other situation this would be useful is if you feel your partner is growing distant, and you fear a breakup is imminent. You might be able to turn things around before it gets to that stage, and obviously prevention is better than cure. There's the cliché image of someone going through a breakup who locks themselves away for weeks on end, lying on their couch in their pajamas eating junk food all day long. Unfortunately this scenario is true for a number of people, and is the worst thing you can do. Ryan attempts to explain here what causes this and how it's something you can change. As tough as it might seem to do, the basic advice he gives is good for getting you out of your depression and focusing on other areas of your life. If you wallow around in your own misery this isn't going to make you look very attractive to your ex. If you can show yourself to be emotionally in control and getting on with your life, you'll be more appealing and your ex may have second thoughts about breaking up with you. There's some solid advice on how to stay positive and motivated to get on with things, even if some of the advice is a bit generalized. For example, you're told that the moment you get over your fear of losing your ex is the moment you'll get them back. This is helpful from a mindset point of view, but in a practical sense it's obviously not going to be true as a rule. If it's true that acting based on highly emotional states is a bad idea, then what you need instead is a rational plan of action. Ryan gives you an outline of what you should be doing to give yourself the best chance of getting your ex back and also improving your emotional wellbeing. There's not much here that is really original, and if you've seen other similar products then you're probably familiar with these concepts already. Be prepared to spend around a month without getting in contact with your ex, as that is the main advice prescribed. For some people this will feel like an eternity, but there's advice here on how to manage it. One of the things that Ryan continually tells you to implement is the 'instant shift technique'. Again, nothing groundbreaking, and not so much a technique as it is a mindset, but it's something you should try to use to keep yourself from focusing on your ex all the time. During the time you're not in contact with your ex, there are also some tactics advised that will possibly make your ex jealous. This is one of the main aims of the system, to make her feel jealous and that she is losing out by letting you go, with the idea being that you win back the power in the relationship. The book does address a number of different reasons why you might have broken up, but it doesn't give advice that's tailored to these situations. It's more of a one-size-fits-all approach that is hoping to appeal to the majority of cases. So the jealousy tactic from above, for example, could work really well or it could blow up in your face. It really depends on why your ex decided it was time to move on. If she felt she couldn't trust you and was worried you were seeing other women, then using jealousy as a tactic is only going to confirm her suspicions and make things worse. This is an instance where a dating product might contain good advice but it might not be relevant to your particular situation. This is the reason we created The Dating Skills Academy, to address issues just like this, so go check it out if you'd like further info on it. The strategy that Ryan teaches here is likely going to be most effective if your girl broke up with you because she was no longer feeling attracted towards you. If you were acting needy and weak, then you'll need to get her to see you in a new light, and that's what this product will help with. However, it's also important to be aware that if you do rekindle your relationship you'll likely need to address any issues you had to make sure they don't come up again. There's not much info here on what to do to make your relationship sustainable going forward, it's entirely focused on how to get them to go out with you again. We've yet to review any products that do a good job in addressing this important point. The culmination of the product is when you arrange to meet up with your ex again. The book claims that she'll almost certainly phone you first, but if not there's advice about how to get in touch with her and compel her to meet up with you. There's not a lot of detail on what to do once she agrees to meet you, so this was a weaker area of the book. It's more about staying in control of your emotions, not acting needy and trying to get her to see you as attractive again and chase after you. This is another instance where the circumstances behind the breakup are going to be important. This strategy may work if she still has some feelings for you and is interested in getting back together, but if she's moved on to someone else or still harboring resentment or anger towards you then you're going to actually need to take steps to address those issues. There are a few bonus books included here, as well as an audio recording of the main book. One of the bonuses is Black Book Mind Control, which is supposedly going to allow you to control anyone to do what you want. Needless to say, this isn't the case, instead being fairly standard psychology teachings. It's a bit of a mixed bag here, with some advice good and other parts not so much. For example, there's a technique on how to set expectations that other people feel compelled to live up to, which is solid. Then there's a technique which involves 'accidentally' sending a text to your ex with the aim of making them jealous, which will almost certainly be transparent and make you look lame. Overall it's worth a read but don't feel like you need to take on board everything suggested here. There's another book which is the 21 Most Important Keys To Getting Your Ex Back, which is basically just a summary of the main book. The third book is the Power Book, which has some brief information on how to establish yourself as the controller in the relationship, instead of the victim. It's just a few pages of bullet points about this topic, then the rest of the book is answering questions sent in from readers.